A series of posts taking you day-by-day through a proposed travel version of my course HIS230L World War I. Read the introduction to the series here, or the previous post here. If it feels like I haven’t had a lot to say recently about the titular topic of this course—at least, not by comparison to my coverage of similarly weighty themes like Swedish immigration, French soccer, and Daryl F. Zanuck — then rest assured: today is the day we come back to World War I—or, at least, to speculating about how it might have transpired differently. But it’ll take a paragraph or three to get there. As our travel course continues, we’ll probably spend the day continuing our study of art as reflecting changing attitudes towards modernity ca. 1900-1920. Now, I’d really prefer just to tell students to visit several other art museums in Paris (Orsay, Louvre, Cluny, in order of personal preference), but if we’re going with the modern art theme, that means heading to the sometimes-maligned Centre Pompidou. 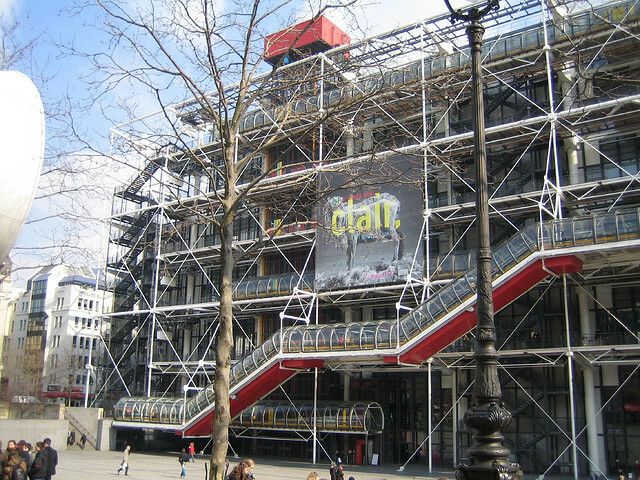 Interestingly, a 1997-98 retrospective on lead architect Richard Rogers said nothing about the architectural feature that first strikes any new visitor to the Pompidou: its “exoskeleton,” which put the building’s innards (pipes, ducts, wiring, etc.) on the outside of the structure. 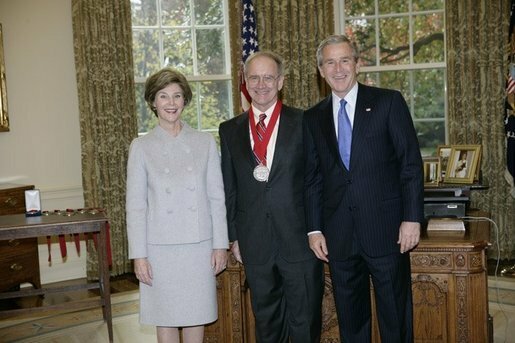 I suppose you could carp that a diplomatic historian like John Gaddis would advocate for this kind of analysis because it privileges his innately narrative-driven field (ditto military and political history); it might be less clear in social or cultural history how the action or inaction of a single person or group at a certain point in time would influence the trajectory of history (or, for especially deterministic historians, even matter). But since we happen to be blogging through a topic that fits squarely within the fields of military, diplomatic, and political history, let’s go ahead and consider two not-too-outlandish counterfactual scenarios related to the beginnings of World War I. 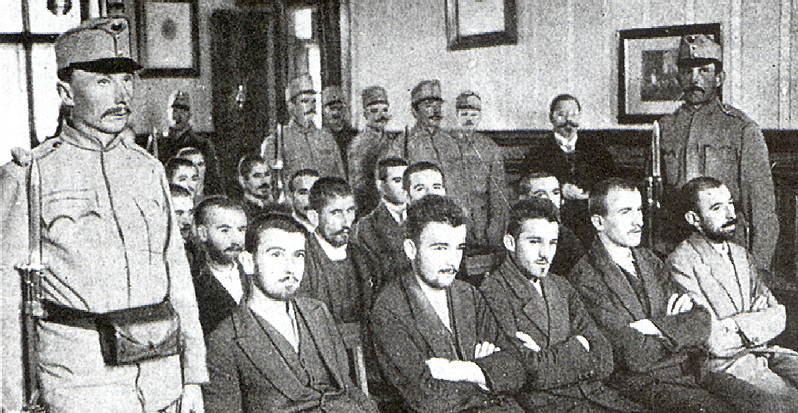 What if… Gavrilo Princip had failed to assassinate Franz Ferdinand in June 1914? This is very easy to imagine, since earlier the morning of June 28 two of Princip’s co-conspirators had failed to act on their chances to shoot the Austrian prince, and a bomb that was thrown bounced off of F.F.’s car. If it’s too hard to imagine Princip missing at such close range, well, his gun might have jammed. Or he might have simply lost his nerve. Or Franz Ferdinand might have understandably canceled his afternoon itinerary after the near-disastrous morning and beat a quick retreat to Vienna, never giving Princip the chance to shoot. In a parallel universe in which Franz Ferdinand lived on, would World War I have broken out? After all, his death was (eventually) followed by the Austrian ultimatum that led Russia to step in on behalf of Serbia, thus bringing Germany, then France, and finally Britain into the melee. Without Bismarck’s “damned foolish thing in the Balkans” transpiring, would there have been a July Crisis and then a world war? Almost certainly yes. First: if not in Sarajevo on June 28th, there could easily have been another spark to set off the powder keg. The Habsburg Empire was too fragile and the Balkans too turbulent to imagine any peaceful settlement of disputes so violent that Serbian nationalists would prefer terrorism to negotiation or peaceful resistance. If 1914–18 marked an epitaph for Old Europe, we may usefully ask: Was it murder or suicide? Popular historians have usually leaned toward the latter verdict, viewing the catastrophe of 1914 as a tragedy of miscalculation, the idea being that no European statesmen were truly guilty of intending the war, at least not the horrendous global war of attrition that it turned into. Since the Fritz Fischer debate of the 1960s professional historians have generally favored the former explanation, explaining the war’s outbreak in terms of German and/or Austrian premeditation, coming down with a verdict of, if not outright homicide, then at least civilizational manslaughter. The German decision for war in 1914, Holger Herwig writes in a recent scholarly collection on the conflict, was not quite Fischer’s aggressive and deliberate “bid for world power” but rather “a nervous, indeed panicked ‘leap into the dark’ to secure the Reich’s position of semihegemony on the Continent.” In the new “consensus” interpretation, Berlin still bears primary responsibility, no longer for premeditated imperial aggression in the sense implied by the Versailles Treaty and by Fischer, but for an impulsive preemptive strike to ward off incipient strategic decline, with further mitigation in that the Germans received a strong assist in unleashing the dogs of war from their equally panic-stricken (and equally pessimistic) Austrian allies. Whether coldly calculating or fidgety, Germany’s military and political leaders sought hegemonic status (and territory in eastern Europe) and believed that their window of opportunity to achieve it was closing. And the Habsburgs and their Hungarian partners also feared that their moment to crush the Serbs and intimidate the other nationalities was passing. 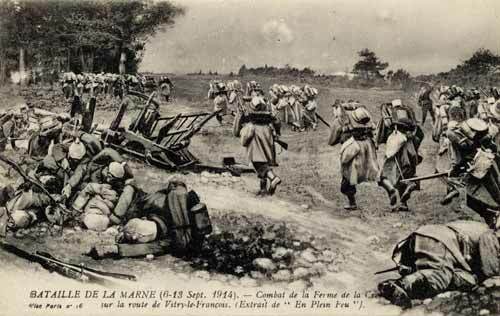 What if… Germany had won the 1st Battle of the Marne? There are all sorts of variables you could change here: the Russians lived up to expectations and took much longer to mobilize; the Belgians simply capitulated rather than mounting a bloody resistance that slowed the German advance; Moltke didn’t weaken his invasion force by sending troops to Lorraine or the East; the French took precious hours longer to recognize what was happening on their flank, or never thought to use Parisian cabs to rush reinforcements to the Marne. I think you can change any one of these variables (and so not violate John Gaddis’ rule) and still conceive of an outcome in which the Allied line did not hold and the Germans took Paris. Here’s where counterfactual analysis becomes less helpful. How far can you spin out the effects of a German victory that never actually happened? Had the war ended then with Germany the victor, no less than 9,500,000 lives would have been saved and an amount of human misery and suffering prevented which no words and no figures can possibly describe. That is the one great outstanding thing. As a result there would be no fascism today and certainly no bolshevism in Russia—if Russia had made peace immediately after the surrender of France. There would be no Nazis, no Hitler, no Mussolini. There would have been no Lusitania case and none of the thousand sinkings without warning of cargo and passenger ships. While the economic shock of the war would have been great, if it had lasted only three months the present economic prostration of the world would never have come to pass. There would not have been the millions of unemployed all over the globe. So much for the credit side. On the debit side we should have an overbearing Germany—just what we have now—a Germany dominant in Europe, with France in its power—exactly as is the case today. The individual German would be so puffed up with pride and arrogance as to be just as unbearable to all civilized people as the Nazis are today. Germany would still be misgoverning its colonies; it would undoubtedly have grabbed a piece of Belgium and added more French territory to German Alsace-Lorraine. Poland would not have been reconstituted, and the Kaiser would probably have helped himself to a good bit of the Ukraine…. Europe would be an extremely unpleasant place to live in—just as it is today; and everybody would be wondering where the Kaiser would strike next—just as we are all wondering whether Belgium or Denmark or what is left of Czechoslovakia will be Hitler’s next objective. Germany would be well on the road to Bagdad [sic], precisely as it is today. Not unimaginable, certainly, but note that this “just as it is today” theme does rest on a tricky assumption: that, in terms of their foreign policies, there was little substantive difference between Adolf Hitler and the Nazi leadership and the Kaiser and his military and (some) political advisors. On the one hand, I buy Fritz Fischer’s conclusions enough to grant the significant similarities in Wilhelmine and Nazi ambitions for hegemony and territory (see above). On the other hand, Villard entirely ignores how Hitler’s foreign policy was inseparable from a racialist view of history that, for all their many faults, Wilhelm II and his general staff did not build their worldview around. But I’m not comfortable enough with counterfactuals to take the next step and link an altered WWI outcome to a parallel universe in which the Holocaust never took place. Intrigued as I am by MIT physicist Max Tegmarck’s belief that such universes actually do exist and wishing that I could teach that twentieth century and not ours. Tomorrow… Walking tours of Paris introduce us to two very different sets of postwar expatriates: writers fleeing Babbitt’s America, and Armenians fleeing genocide.